Some children remind us of flowers or stars. Some children remind us of sunlight, wind, trees or rain. 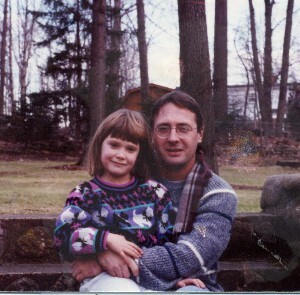 My daughter Chelsea was a meteor…white hot, streaking, burning and crashing into our lives, demanding our attention. Her spirit popped out indignant, somehow angry at the restraints placed on her by being human. I used to take her food shopping, and the stories of her escapades in Shoprite are, to this day, legend. Her tantrums were awe-inspiring. I once told this little two year old that she’d better settle down or she’d be in time out when we got home. She looked at me with that patented Chelsea scowl and said “You getting on my nerves!” a phrase she’d obviously heard once or twice. For a while, we lived in a small townhouse in Lakewood. There was a period of time when every single chair in the house laid on its side. At two years old Chel would drag any standing chair she could find, anywhere, to climb on anything she damn well pleased. I once found her on top of the refrigerator. I once took her out of the high chair, set her on the ground and turned to shut off the water in the sink. In the space of literally 25 seconds, she had waddled out of the kitchen, down the hall, up the stairs and was sitting in the bathroom sink. When she set her mind to something, even at that age, God help you if you got in her way. With Chel, you were either on the train, or on the track. Chelsea’s liabilities, like every single one of us, were of course her greatest assets. I often said that if she survived, her tenacity would make her a world-beater. She had a huge heart, and loved her family and friends with that same feverish intensity that led us to call her “The Chelinator.” She loved missions and I often referred to her as my “guided missile.” If it was a task she accepted, she wouldn’t stop until the job was done right. She was, to the end, perhaps the most fiercely loyal person I’ve ever known. There is a tradition among some of us. We throw pies at each other. Hard to comprehend, I know, but trust me…it’s an act of love. The first time I hit Michael with a pie, we were all, uncles, cousins and friends, standing around laughing, save one. Four-year-old Chelsea was furious with me. She ran up and kicked me in the shin, and yelled, “That’s my brother!” She was one who you absolutely had to have on your team. And if she wasn’t on your team, trust me, you didn’t want to be in the game. Those of you who are close to me, know of my deep spiritual commitment. I try to live my life literally as a prayer, and for the past 25 years my prayer has been the same. “Help me to open my heart. Help me to learn the blessing of forgiveness. Help me to learn Unconditional Love.” In my belief system, there are no mistakes…just endless opportunities for forgiveness and healing. And therefore, the people in my life who push my buttons, who frustrate me, who sometimes infuriate me, are my best teachers. Chelsea was, is now, and will continue to be the most revered and greatest teacher in my life. And in typical Chelsea fashion, she has answered my prayer to open my heart…full frontal assault and take no prisoners. So that’s my redemption. I choose to live, and honor Chelsea’s life with mine. Someone once said, “ If you had 24 hours to live, who would you call, what would you say, and what are you waiting for?” I’m not waiting. I’m going to continue to tell my friends and family that I love them whenever I can. I’m going to keep hugging Michael. I’m going to keep praying. And I’m going to try to remember that there’s no light at the end of the tunnel. The Light is right here and right now. She is not gone. She is only changed. I guess I just have to learn to listen harder.